Can't say anything bad about this ball. Only thing I might do is hit it with a 4000 pad just to cut the down on the back end reaction a little. I have the Badger, The Claw, and I wanted this as soon as I heard about it. All 3 balls pretty much drilled the same, all pin up. So when I need to start with the claw, I can work my way down. Awesome set up and you can't go wrong, Plus is does not get dirty like the other white balls on the market. I'm very impressed! Love the ball. Drilled it pin up and was very surprised with the length. . For me I played up 8 board with the ball making a nice controlled move to the o jet. Ball wasn’t skid/flip at all for me. Had a good set of 650 with OTB. Likes:COLOR Doesn’t get dirty and black marks on it. Agree with MPW. Ball is awesome. I had better length and control with the White Hot Badger than anything else i have used this year. Excellent Length, and unbelievable pin carry for me. Slow speed, high revs. I played 18 to 8, and had a very controlled back end. Love the ball! Likes: Clean thru the fronts, stored energy, easy to find on the ball rack. The 900Global White Hot Badger offers the most skid/flip reaction in the 900Global symmetric line to date. This comes from Global !! This ball really moves on the backend. This will be great for bowlers who can generate enough ball speed and revs to make it do what its designed for. For me I'm a 'stroker' and its hard for me to control a skid-flip ball on a house shot. and more of a sharper move to the pocket. Just like the Badger it’s good for all styles. I drilled my White Hot Badger exactly like my Hybrid Badger, 60 X 3 3/8 X 40 my favorite layout. When my Badger starts to break early I can switch to the White Hot and play the same shot. for your arsenal, great for fresh medium patterns, medium dry patterns and even medium oily patterns. It has become my favorite ball, get one ! Here is my review of the 900 GLOBAL WHITE HOT BADGER. I drilled the 15lb version 70 x 4 ½ x 50. I left the surface on this one at factory. I plan to take the polish off at a later date with a 2500 sandbagger pad followed by a used, wet 4000 pad at high speed. 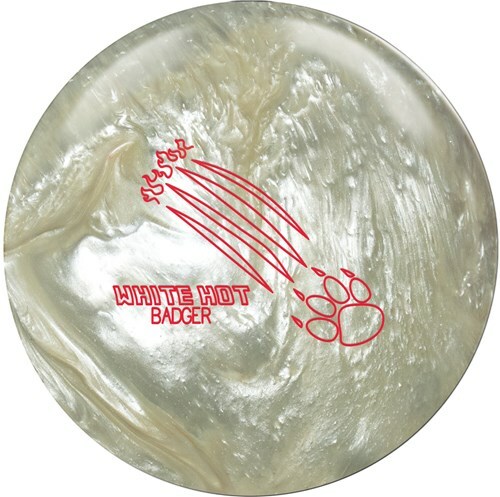 I found this to be quite a different ball from both the Black/Blue BADGER and the gold HONEY BADGER. It gets through the heads and mids cleanly but if you have black grips you can DEFINITELY see the core transitioning the moment it leaves your hand. It’s almost like the ball rolls itself or winds itself up. I can keep my track higher and let my release just be what it is and still watch this ball form up to the pocket in a beautiful shape. It is definitely a little better swinging left to right with the factory cover. It should be great dull for lower rev players or at straighter angles. Once this core gets into the roll phase it’s basically a white 84-ton Army Tank. The continuation is unbelievable. I also plan on drilling another with a pin down layout or with a little less pin to PAP distance to see how well it contends as a ball purposed for straighter angles. Overall I definitely see why this ball is considered as a GEM. It is a very special piece. This ball has become one of my favorites. It allows me to get deeper inside than most and generate area on a house shot. I am surprised that it doesnt get as dirty as other white balls out there. If angle on the backend is what you are looking for, the White Hot Badger is the answer. This is the most angular ball to date w/in any of the 900 Global lines. This ball gets through the fronts easier than its predecessors and reacts incredibly strong off the spot exploding the 1-3. Fantastic ball when the lanes call for opening up your angles.